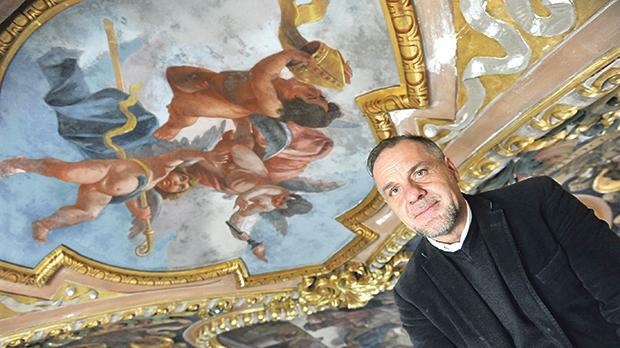 Conservator Fr Charles Vella tells Fiona Galea Debono about the importance of sacred art and the work being done on St Paul’s Shipwreck church in Valletta. 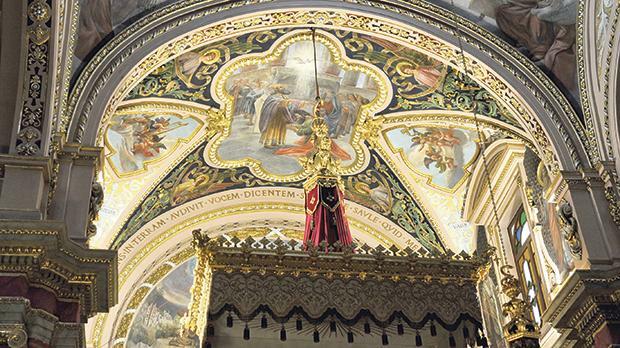 Conservation and restoration work on the paintings of the choir vault in St Paul’s Shipwreck Church in Valletta were recently completed in time for the feast, but the entire ceiling is in dire need of intervention to save it from being lost. The man behind the project, Fr Charles Vella, said the event was an occasion and an invitation to visit the church with a fresh eye; to try and appreciate the message and importance of the sacred art that has been resurrected… and to leave a donation to be able to continue salvaging the rest. A shortage of money could stall the project and the parish is appealing for more funds to be able to continue the work and to save other masterpieces in the church that are in need of repair. “The thing is the whole church exists in humidity,” pointed out the priest, conservator and restorer all rolled into one, insisting it should not be neglected and problems dealt with as soon as they arise. Fr Vella suggested constant monitoring of the whole church and not just the ceiling, adding that the parish should create a foundation that would work to generate funds for its upkeep. The situation had been left to degenerate to this stage due to neglect that had stemmed from a lack of finances and human resources. The parish of St Paul’s Shipwreck, one of three in Valletta, had shrunk considerably, with an exodus from the capital over the years due to the rise in the cost of property and because it was not a family-friendly city, Fr Vella maintained. “We currently have around 1,800 parishioners, which means a lack of offerings, and we rely on benefactors, private people and fratellanzi (religious fraternities) to embark on projects of the sort. “Churches are like private entities and are not entitled to help from the government,” he said. “The Church as an institution is the legitimate guardian and has the final responsibility, but they are also community property, meaning the community has a role too. “The Church is doing lots of restoration, with the assistance of the respective communities, but help is always needed,” he insisted. Fr Vella originally had assistance from overseas, but this proved to be too costly, so he has since tackled the highly scientific project single-handedly, on a shoestring budget that has to cover the whole restoration process, including the materials and the re-guilding. The choir section, which needed urgent intervention, took almost two years to complete due to its bad state of conservation, including the stone structure itself as a result of water infiltration, which has now been treated, and rising damp, which is beyond control. “It had deteriorated to the point that nothing could be attached to the ceiling anymore,” Fr Vella pointed out, adding that the paint layer was completely loose and could be rubbed off with his hand, while the plaster was also damaged. Large pieces of the Baptism of St Paul had actually fallen off. Splendour of the sacred at St Paul’s Shipwreck church. The intervention involved the consolidation of the pigment and support layers, the migration of salts, the injection of chemicals and the insertion of microfibre pins to make doubly sure the painting would not fall off again. And from a conservation point of view, the frescoes are now “healthy”. Commissioned by the archpriest Rev. Can. Vincent Borg on behalf of the Collegiate Chapter, the choir vault paintings by Attilio Palombi, dating back to the early 20th century (when most churches in Malta started to be decorated with frescoes) are “fresher and radiant”. The colours are actually “emitting light”, following the removal of the dirt, pollution and salt layer, and retouching. The gold is now “vivid and alive”, and the ceiling looks “elegant”, almost surpassing Fr Vella’s expectations. He is currently working on the main nave, which should be completed by July if no complications arise; but it will take another three years for the entire project to be finished. Speaking about his dual role as priest and conservator/restorer, Fr Vella admitted there have been times when his dedication to sacred art was frowned upon, and at the start of his career, it was seen by some as a way of escaping his duties, which were considered to be saying Mass and hearing confession. But for Fr Vella, “it is not weird to have a role other than priesthood. In fact, I believe my work as a conservator and restorer complements my pastoral mission and the two go hand in hand. Involved in what he considers to be some of the most “prestigious” restoration projects in Valletta, including a challenging pre-Caravaggio painting in St John’s Co-Cathedral, which had been rolled and broken during the war, and the Ta’ Giezu Crucifix, which is a national icon and is currently undergoing treatment before restoration starts, Fr Vella said that even though he worked in Rome – “which is what it is” – he was happy and proud to be doing this work in his own country. “I love working amidst these beautiful faces, and I am always amazed at how artists captured such beauty, reflecting the divine in humanity. I find it contagious, inspiring and a means to encounter God,” he said of his appreciation of sacred art, which he wanted to share and spread. “Today’s feast is a call not only to believers but to everyone to show respect to our forefathers, who have left us such an important patrimony, which has formed our national identity, not just religious, but also cultural and psychological. “Iconography does not just help the faith to grow, but also forms the psyche of society and is the basis of our culture. “Today,” he implored, “look at the church not just as a place of worship but also a place of art, designed to bring us closer to God and to remind us from where we have evolved culturally.